These carbon steel trimmers have chrome over nickel plating. Knife edge and blunt tips options are available on most models. 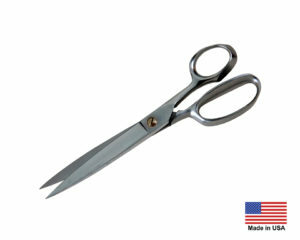 All shears shown will easily cut rubber, cord, and multiple layers of fabric. Ergonomic and large ring models have and extended bottom handle for additional comfort and cutting leverage. Made in USA. Our most popular models are shown here. Everhard stocks additional sizes and brands depending on your requirements. Call us toll-free at 1-800-298-2832, or 1-330-453-7786 outside the U.S.